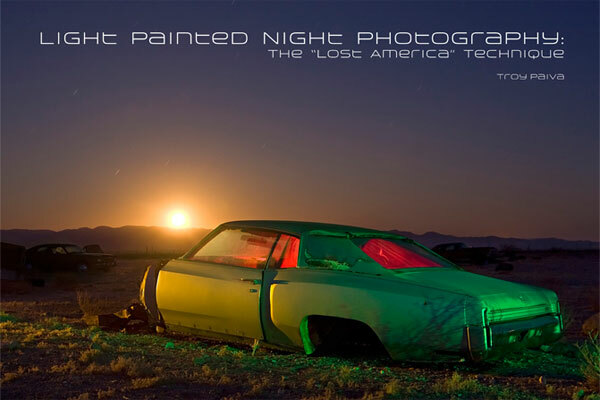 Urban explorer, light painter, and night photography pioneer Troy Paiva has released a new light painting photography tell all book that breaks down 44 of his incredible images. “All the secrets of his working process, never revealed before; from light settings and gel types, to white-balance methodology and post-production techniques are revealed. Each of the 44 images gets the full treatment; not only full explanations of his lighting and exposure methodology, but also anecdotes on compositional strategy, waiting for the decisive moment and making the best of difficult working situations. I caught up with Troy and asked him a few questions about what we will find in this new book and what he thinks of light painting photography today. LPP ∇ First Troy I want to say congratulations on the release of your new book! This makes number 3, do you ever get any sleep! TP ∇ Only in my coffin during the day. LPP ∇ Can you tell me a little bit about the book, what will the readers find inside? From the description it looks like this one is more of a “How To”? TP ∇ Yes, this book is a pure “How To” piece. After teaching workshops for the past 4 years I’d amassed a huge stockpile of notes and info. People always seem to be most curious about how I actually do this work, so I put the book together over the last year using my teaching aids. It’s over 80 pages and 20,000 words. Much more writing than in any of my previous books, but the in-depth deconstruction of 44 full size, zoomable images–several of which have never appeared online before–make this my most informative book for other photographers. 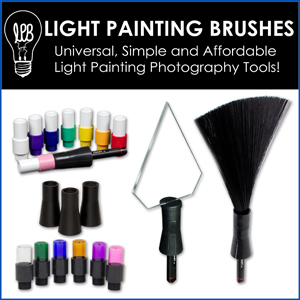 LPP ∇ Why did you choose to publish a “How To” light painting book? Its awesome for the rest of us but what made you want to give away your specific techniques? I read that you are even giving away exact gel colors used to create certain images? TP ∇ Why not? None of this is a state secret or anything. There’s plenty of people out there figuring out aspects of it on their own, the same way I did it, anyway. And plenty of others over-complicating the process too. I still run into people that think I use light stands and umbrellas and stuff, so I wanted to dispel all the myths and show just how DIY and downright easy these effects are to achieve with just a few dollars worth of gear. LPP ∇ Besides hitting the bestseller list and the fortune and fame that goes with that, what is your hope for this book? TP ∇ That it prompts thousands of people around the world to go out every full moon and use these techniques. Looking back 10 years ago, there were only a handful of serious night shooters and light painters on the planet . . . it blows my mind how far it’s come, but also, how much further it can still go. LPP ∇ Your light painting photography has inspired countless photographers, Nocturne being one of the more notable, after people get their hands on your light painting cookbook I’m sure you will see many more images inspired by your work! How does it feel to see your influence in other people’s work? TP ∇ It’s a thrill. I stood on the shoulders of some great photographers to get to this point, it’s an exceptional experience to see others standing on mine and reaching even further. 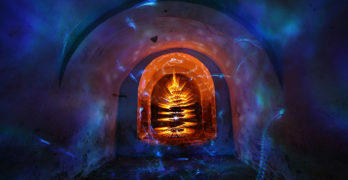 LPP ∇ What do you think of the present state of light painting photography. TP ∇ I’m amazed by it. How far things have come, just in the last 5 years, it’s nothing short of astonishing. Now that you can chimp the shot before you ever pick up the tripod, it’s become very easy. There’s really no excuse to not reshoot it until you get it perfect. LPP ∇ Where do you think light painting photography going? TP ∇ LP is perceived as this new thing, but the reality is that photographers have used added light since the very beginning. With modern gear it’s just become much simpler, more fool-proof, so the numbers of people who experiment with it continue to escalate. The sky’s the limit. LPP ∇ Where can we get the book? Are there hard copies available or only the E-book version? LPP ∇ Not only are you releasing your specific techniques to the world in this new book but you also hold light painting workshops where photographers or anyone wanting to learn your technique can come spend a few days with you, when is your next workshop? LPP ∇ Thanks for taking the time to answer a few questions Troy I wish you much continued success! Hi Ashley. I’m aware of the technique, but I left it out because looking as a laser point like that, even if it’s just reflected, can damage your eye. You should avoid doing this.